Five shining stars! 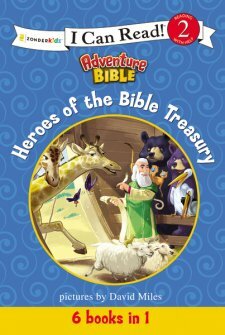 Heroes of the Bible Treasury is by far my favorite book that I have personally read by The Adventure Bible company. I have yet to be disappointed with their, "I Can Read!" series and was looking forward to this book since it includes six in one. The stories are a good length. This book is only a few pages short of two hundred, each story about thirty pages long. Even though it might seem quite lengthy for a child who is learning to read, it isn't, each story is the perfect and the child feels quite accomplished when they complete each story. My second grader was thrilled when this book arrived in the mail and immediately began thumbing through the pages, enjoying the pictures and looking to see which Bible stories it contained. He was most excited about Noah's Voyage, and read that first. He also couldn't wait to begin Paul Meets Jesus because he is learning about Paul in our family Bible study. What I appreciate about these stories is the author's attention to detail. Generally children's books skip a lot of detail because they are teaching the basics and just trying to get the main idea across. This is understandable for toddler books, maybe, but we often don't give children credit for what they can understand. If we present them with the facts, then at least they are exposed to it. They may not remember every, single, detail but at they oftentimes absorb so much more than we realize. For example, the story of Noah includes how old Noah was when he built the ark, how many days the ark rested before they left the ark and the fact that the ark rested on the mountains of Ararat. It is very close to the actual biblical account but written in a way that a beginning reader can read it. Of course not every little detail can be included and my son picked up on this. In the story of Esther, my son noticed that only one feast that Esther held for the king was mentioned, not two. He also picked up on the fact that in the actual biblical account, the last dove that Noah sent out never returned but the last bird mentioned in this book was the dove with the olive branch. Overall, I highly recommend this book for beginning readers. My son felt confident reading these beloved stories and looks forward to more opportunities to do so. Disclaimer: Thanks to the Book Look Blogging Program for providing me with a free copy of this book for the purpose of this review. All opinions stated here are my own.